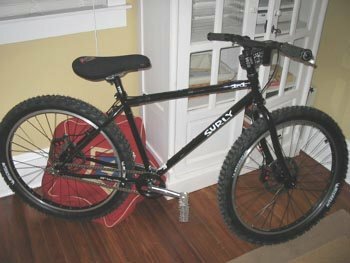 I am submitting my new build, a Surly 1x1 with SS and fixed gears. I've raced DH for some time, but singlespeeding is a new experience for me. I just love the SS scene--it is the best ride out there besides my DH bikes. I like the DH feel, so my fix has some DH aspects--like the big Michelin tires in the picture. Magura Gustavs with the 8 Rotors, a bit overkill but I like 'em! Rick Fichter fell off the map shortly after submitting this piece. If anyone knows where to reach him, please send us some contact details. Surly's cheap, functional bikes are a big favourite with 63xc.com readers. Other Surly fixers include Jezz Harty and Dan Artley.